Affinity purified against GST-TRAFD1 (101 – 582) [DU 20511] and then depleted against GST. 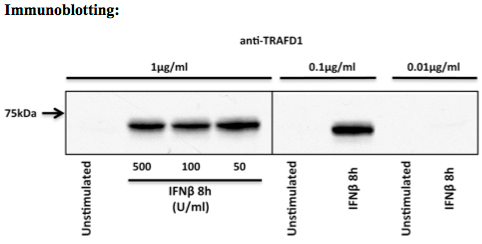 RAW264.7 cells were treated with IFNβ for the indicated times (to induce expression of TRAFD1) and with the indicated concentrations. 25 μg total cell lysate was loaded on a 10 % polyacrylamide gel and blotted overnight at 4 °C with anti-TRAFD1 in 5 % milk at the indicated concentrations. Secondary HRP conjugated anti-Sheep antibody was used at 1:10,000 dilution for 1 h at room temperature. Bleeds 1, 2 and 3 performed similarly. The above image is from bleed 1. RAW264.7 cells were stimulated with IFNβ for 8 h or left unstimulated as indicated. Cells were lysed and total cell lysate (lanes 1 and 2) was run alongside supernatants after immunoprecipitation of 1 mg cell lysate with 0.5, 1, or 2 μg anti-TRAFD1 (lanes 3-8) or 2 μg of sheep pre-immune IgG (lanes 9 and 10) coupled to ProteinG-Sepharose beads. 25 μg of lysate was run in each case. The above image is from bleed 1.